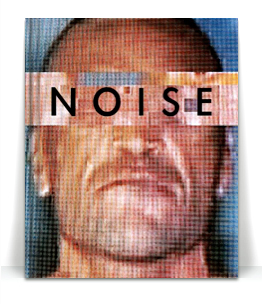 I’ve made a new Blurb book, called Noise. It’s photographs of faces from a TV screen. Because of poor reception on the TV, the images have distorted in interesting ways, faces of actors and celebrities have disintegrated in beautiful but disturbing patterns. You can see a preview of it the Blurb website. Signal-to-Noise ratio is a measure of how much information is transmitted in an electronic communication compared to the random data caused by interference. The faces in this book were photographed from a television with poor reception. The noise caused by some unknown disturbance ruptured and fragmented the intended signal – the faces of celebrities, sports heroes and fictional characters on daytime television. In this decay of communication, new and unintended messages are discovered. 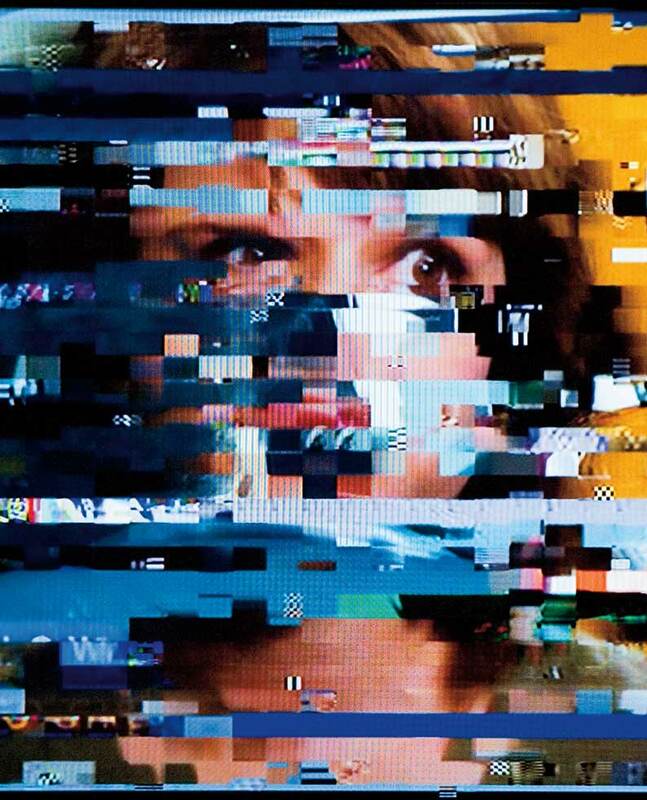 The broken images on the screen create a disturbed alternative world of disintegrating faces and troubled encounters. 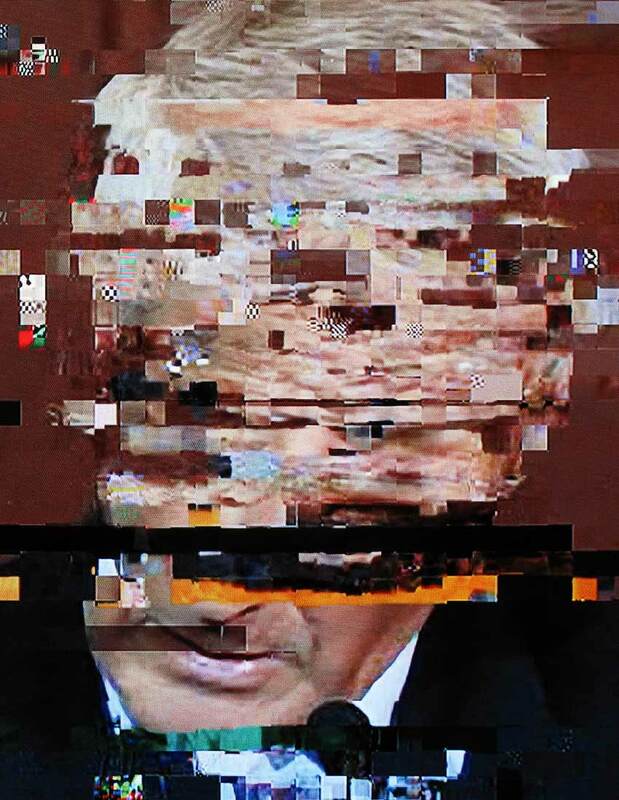 The disordered electronic signals suggest other disorders: the images in NOISE show psychological disintegration amid the wasteland of commercial broadcasting. Is there something familiar to you about this image of dreary suburban corner? 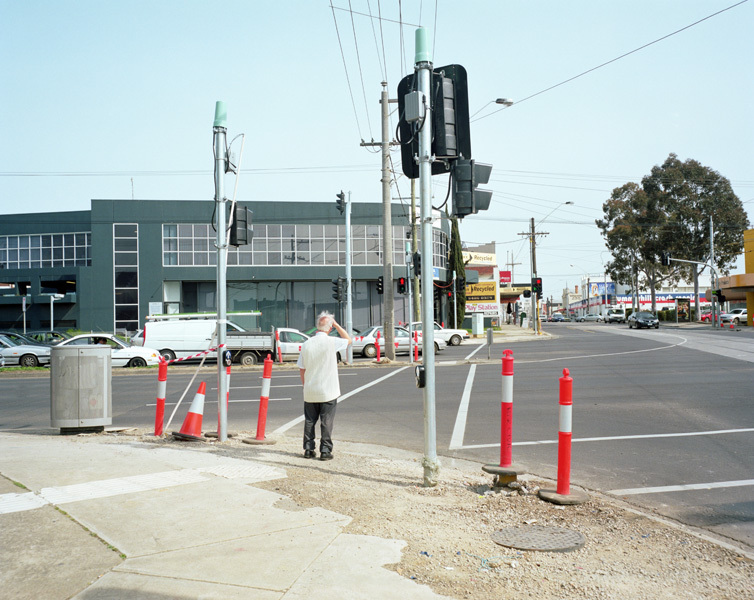 It was taken by the brilliant Melbourne photographer Louis Porter who has a line in wry visual humour of a uniquely Australian kind. He focusses on the banal corners of everyday life but injects them with wit and sophistication. 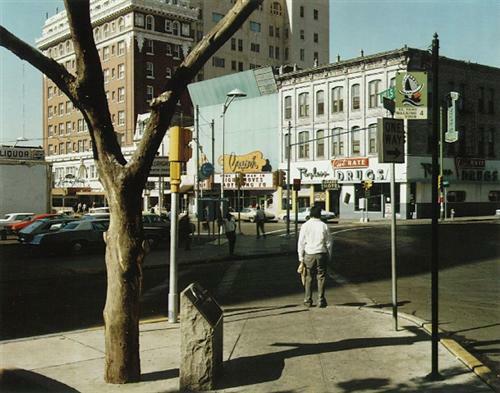 Porter’s image is a take on Stephen Shore’s great photograph of a street corner in Texas. That image (below) was part of the currency of the postmodern debates of the 1980s about Culture and Nature (remember Baudrillard?). Clearly, nature was losing. That lonely, neutered tree was an echo of the lonely, neutered man on the corner, his slumped shoulders denoting the exhaustion of the western male hero that the location – El Paso – evoked. Porter’s image even lacks the tree, replaced by a garbage bin, or by the traffic sign. The resigned body language is the same though, the shambolic figure is at one with the landscape of suburbia. My new project has just gone up in a group show at 69 Smith Street Gallery in Fitzroy. The show is called Bound by the Book and I’m sharing the space with four of my talented former students in Photo Media at NMIT: Bernadette Boundy, Sue Lock, Sally D’Orsogna and Margot Sharman. The theme is the book in its various roles, as aesthetic object, as entertainment and as container of memory. The work I’ve produced is taken from an 1845 edition of Boccaccio, the 14th century writer, so it’s doubly distanced in time. 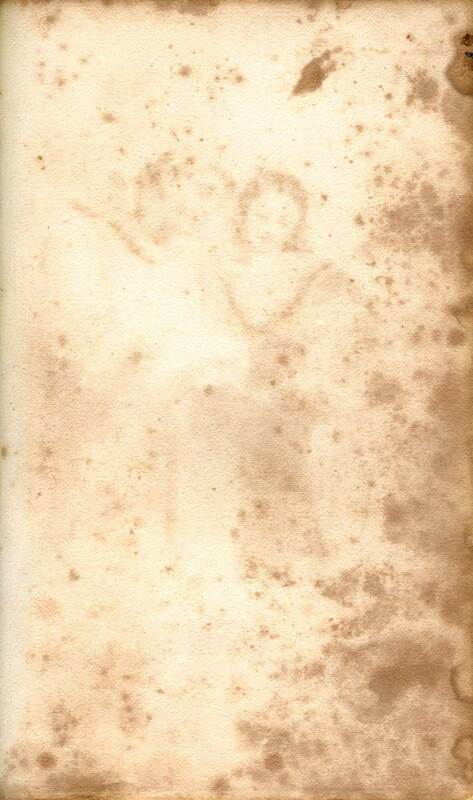 The book is intact but badly foxed, making beautiful patterns of decay through which the engravings can be just seen. My images are scans of the backs of these illustrations. The Fatal Dream is the title of the last illustration, the reclining figure of a man. It seems a poetic description of our own lives, that we live in a dream from which we do not wake. 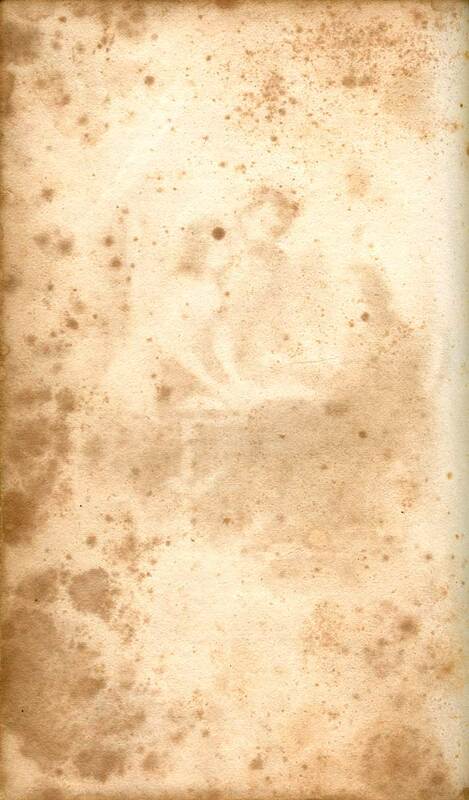 Both the book and the stories are ancient and the images convey that sense of time receding far back into the mist, with the voices from other lives growing dimmer. Since a book is a container of stories and characters, it resembles a human life, which itself has a beginning and an end. After that end, the memory of a life fades away, like the pages in this book.